You know already that this amazing Hampton home has my name written all over it. Ina humble nod to Vince Camuto's passing this week, it seemed only appropriate to showcase one of his great personal achievements: restoring a waterfront Jazz Age mansion to its former glory. 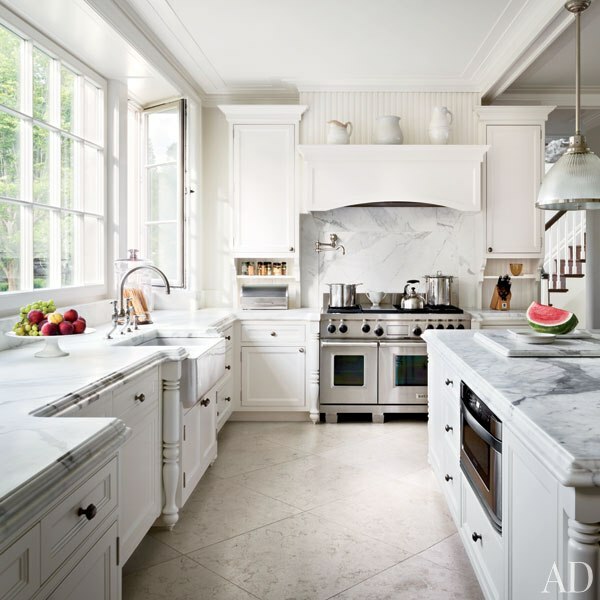 He and his wife & business partner Louise lovingly took on the challenge of repairing and resurrecting a 21,000-square-foot stuccoed estate and making it modern while retaining its classical roots. The photos of restored Villa Maria are nothing short of breathtaking. Considering the couple's unmatched professional success at building global brands we shouldn't be shocked at their ability to turn a dilapidated estate into a fresh sprawling residence. But still, renovations are a labor of love and require discipline, tenacity and commitment. All traits these moguls no doubt possess. And...it helps that this wasn't their first rodeo. 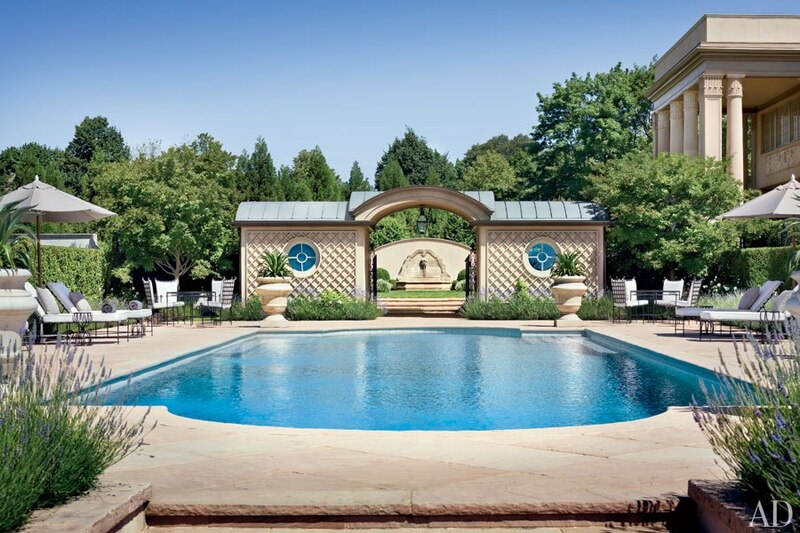 They brought a French Norman estate in Connecticut out of ruin years ago, so this Gatsby-esque structure was a challenge they were prepared to face. While it would have been easy to turn this manse into a gaudy affair, what I appreciate is their restraint. The soothing color palette, aged finishes and open airy spaces bathed in light are nothing short of spectacular. Along with co-conspirators NYC architect Andre Tchelistcheff, landscape architect Edmund D. Hollander and celebrated Manhattan designer Carol Egan, they transformed a vast mansion into a welcoming and inviting home. No easy feat. The result? Chalk, pale ivory and dove hues come to mind. While there are shimmering details, the interiors exude casual elegance and family-friendly appeal. I can almost imagine them entertaining their extended family on the lawn and enjoying the magnificent waterfront view. While I wish for us all to own our own Villa Maria one day, you can infuse a touch of its effortless glam with a few carefully chosen pieces. I've shown a few of my favorites below. But be sure to go back and read the ArchDigest feature on the home to learn more about their magnificent dedicating to the estate and to creating an intimate home within. This pretty perch is versatile and functional. Place in pairs in a living room, at the foot of a bed in the bedroom or along a wall in a wide hallway. A pretty chandelier in a delicate gray patina. Dreamy! Add a pretty neutral throw on a chair or ottoman for an instant "come stay a while" vibe. Every room benefits from a piece showing a bit of age and patina. I love this distressed white chest in a hall, a dining room or a bedroom. Live orchids are always better than faux, but for high quality silks never need to be watered and will never need repotting. I love that this garden stool features floral cutouts and an unexpected concave silhouette. Nothing beats an orchid in an urn. I love this etched mercury glass version. Capiz shells lend a glowing aura to the petals this pretty pendant light. A traditional oushak rug gets a fresh new look in dreamy dove and ivory. Unify a large seating arrangement with one of these underfoot to ground the room. Classic carved Louis XVI dining chair pairs well with everything and can be moved around a room as needed. An elegant beveled mirror in gilded finish reflects light and brings sophistication to any wall. This chic upholstered tête-à-tête in dreamy neutral linen can float in a room and be a favorite place for intimate conversation or a midday nap. A lyre lamp brings a nod to history and classicism without saying a word. Glamorous embroidered pillows are always part of a well designed space. Buy in pairs and enjoy for years to come.